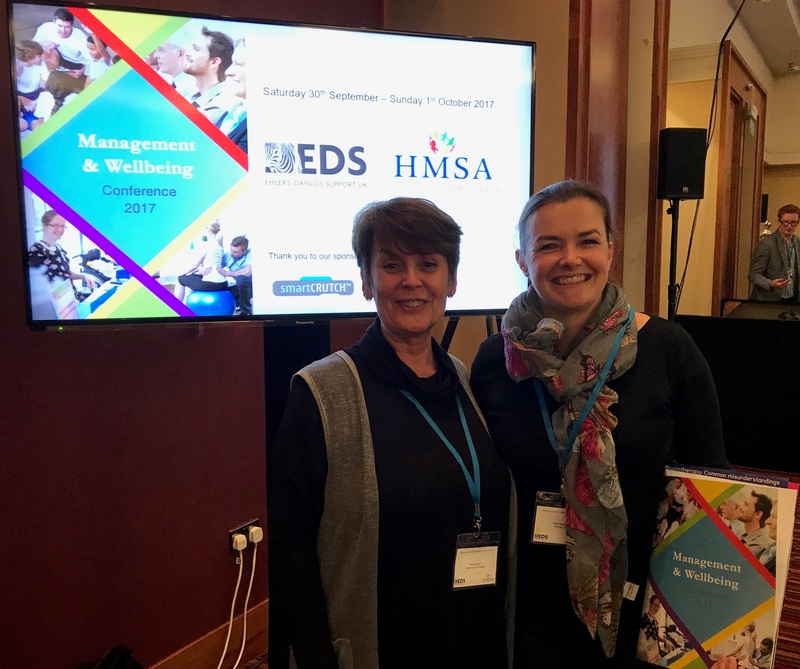 Halo’s Nicki Bradshaw recently attended the Management and Wellbeing Conference 2017, after being invited to attend with her patient Marie. The conference focused on Hypermobility disorders and more specifically Ehlers-Danlos Syndromes (EDS). Nicki and Marie heard several specialist speakers who disseminated the very latest research on the conditions and their management. EDS are a genetic disorder in which the structure of connective tissue is abnormal due to a genetic mutation. This results in abnormally fragile and hyper – stretchy tissues throughout the body, resulting in a wide range of bodily symptoms. There are different types of the condition, and the severity and nature of symptoms can vary greatly between patients, meaning that whilst many people can continue to lead a full, active lifestyle, others suffer more life limiting issues. The most common type is Hypermobile EDS, where symptoms can include joint instability (subluxations and dislocations), chronic widespread joint pain, “brain fog” and fatigue, stretchy skin that can bruise and scar easily and is slow to heal, gastrointestinal problems linked with dysmotility, problems with the autonomic nervous system; and general laxity of tissues leading to hernias, pelvic floor prolapse and urinary issues. The condition (which is actually no longer considered rare – affecting at least 1 in every 5000 people worldwide), can often take many years to finally diagnose correctly, with specialist services unfortunately still hard to access outside of London. Physiotherapy can be very useful in offering a specific exercise programme to strengthen particular muscles and therefore help stabilise the affected peripheral and/or spinal joints; and also to help improve proprioception (joint position sense) and balance, which is often also affected. Manual therapy and massage can also be used to release tissues and joints that may have become tight and stiff due to compensations the body has made to try and manage unstable areas. Joint protection advice and taping may also be appropriate as well as pain management strategies.